The new casual game takes players down the historic Silk Road, crossing four unique empires with their cute camel companion. Your camel companion Matthias will help you succeed! Building upon Dig-iT! Games' collection of historically-influenced games, Silk Road Match 3 sends players down the path to becoming the most famous and successful trader on the Silk Road. Dig-iT! Games, an entertainment and educational game company, today announces the launch of Silk Road Match 3 for casual mobile and online players. Building upon Dig-iT! Games' collection of historically-influenced games, Silk Road Match 3 sends players down the path to becoming the most famous and successful trader on the Silk Road. 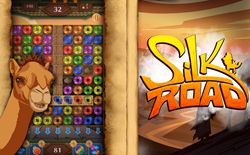 Available to download for free from the Apple App Store, Google Play, Amazon App Store and Facebook, Silk Road Match 3 is an adventure where coins rule. Players will pack their camel and use ancient coins to solve puzzles while visiting trading posts, villages and cities along the long trail between the Roman and Han Empires. Silk Road Match 3 also introduces the soon to be famous character Matthais, a sassy and cute camel companion who shares the secrets of the Silk Road with some attitude. The Roman, Parthian, Kushan and Han Empires also include guard characters that challenge Matthais and the player at their empire gates. The 6,000km Silk Road will take players from the sunny Mediterranean, through arid deserts, over high mountains, and across the Asiatic Steppes, visiting trading posts and important cities along the way. Players will need to solve puzzles to earn the trading power necessary to pass into each of the four empires located along the road, or else they won't be able to continue their journey. As they progress along the ancient trade route from Rome to China during the 1st century AC, players will use ancient coins suitable to each empire to play through the match 3 adventure. Success will help build their reputation as a master trader. To help them with more challenging puzzles, players can make use of a strong selection of boosters and a coin toss in fountain of luck as a bonus each day. Many puzzles will require the player to uncover buried coins in the sand or collect ingredients such as saffron, olives, snails, cherries, onions, and purple carrots, as well as reaching a targeted score. Today, Silk Road Match 3 traders can travel through 225 exciting levels spanning three empires with additional levels and the Han Empire coming soon. Players can also look forward to special events in the game, such as the Chinese New Year in February 2018. Special events will feature costumes for Matthias, decorated maps, and festive effects for boosters. Thousands have already played the beta version of Silk Road Match 3 and can continue their journey in this updated edition. About Dig-iT! Games: Dig-iT! Games is an award-winning game studio delivering casual and educational games to game users worldwide. Our mission-based game development studio is dedicated to creating new educational games each year that encourage kids to explore the world around them. Founded by professional archaeologist and former middle-school teacher, Suzi Wilczynski, Dig-iT! Games develops educational tools that promote critical thinking, independent learning and cultural understanding. Our recent expansion into casual games is an extension of the overall goal to provide a seamless blend of fun and learning with games.